One morning, Julia and her parents wake up in their suburban home in California to discover, along with the rest of the world, that the rotation of the earth is noticeably slowing. The enormity of this is almost beyond comprehension. And yet, even if the world is, in fact, coming to an end, as some assert, day-to-day life must go on. Julia, facing the loneliness and despair of an awkward adolescence, witnesses the impact of this phenomenon on the world, on the community, on her family and on herself. 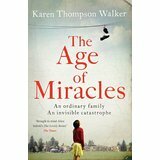 I found this a quick, easy book to read and I really enjoyed it – but in a way I’m not really sure why! The premise is really interesting – the turning of the world has slowed, causing the days to get longer and longer. Some people choose to carry on living on “clock time”, so they get up and go to school and work, even if it’s pitch black, and they go to bed at the normal time, even if it’s daylight. Others choose to go with the flow, sleeping only when it’s dark and staying up when it’s light – even if this means they’re awake for many more hours than is normal. The two factions turn against each other with the real-timers becoming like tribes. But despite this interesting and unique idea, somehow very little actually happens in the book, and the characters are – in all honesty – quite dull. Our narrator, Julia, is very quiet and is more of a bystander than an active participant in anything that happens around her, and after finishing the book it is hard to say much about her personality. The others around her are more interesting, and I liked reading about her rebellious neighbour and her love interest Seth – although again perhaps more could have been done to develop these characters. There isn’t much science around what is happening, and what there is comes with a light touch. Some readers could find this frustrating as they might feel not enough explanation is given or that they can pick holes in what is there, but personally this wasn’t an issue for me as I just accepted what was happening and enjoyed the story. I would have liked a bit more around some of the characters and I did feel it needed to go a bit more in depth about certain relationships and people within the book. But overall I did like this – it felt a bit different and was a good, easy read. I do recommend it – it’s a bit different and a quick read!